When I read this article on the benefits of being a Big Book Buddy, I reflected on my own children's experience as Big Book Buddies. 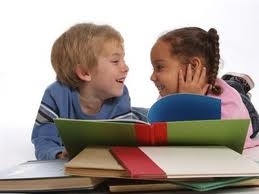 We have all seen the research on the benefits to the Little Book Buddies; they have a young role model to look up to, they look forward to reading with their "big friend," they get to see good reading behaviors in action, etc., but what about the benefits to the Big Buddies? Well, from my own personal experience, my children love being Big Book Buddies. Since the first summer that my older child was old enough to participate, my younger child wanted to participate too, so the Little Buddy, then an adorable four-year-old girl, actually ended up with two Big Buddies. She would sit in the middle of the bean bag chair in the library, with my children on either side of her, taking turns reading to her. She would make pictures for them each week, and they would spend time excitedly poring over books, searching for just the right books for her. The following summer, my youngest was old enough to be a Big Book Buddy, and the Little Buddy's younger brother was now old enough to be a Little Buddy. So, evenly paired off, the four children would read together. Each subsequent year we would request to be paired up, and each year the same thing would happen. My children would spend time during the week searching for just the right books to read to their Little Buddies. They would take books off our shelves at home, skim, shake their heads and put them back, or nod enthusiastically, saying, "Oh, I loved this book.," or "He'll love this. He loves Darth Vader." Then once a week at the library they would sit with their buddies and read and read and read. The reading sessions, which were originally scheduled for a half an hour, kept growing and growing and growing. Nobody wanted to stop reading. It was amazing to see. Even more amazing, I realized I had time to sit.... By myself... Without anybody asking me to do something for them.... In a library.... Where it was QUIET! ... Talk about benefits, I love this program!